AFGHANISTAN, Mazar-i-Sharif – Yesterday, U.S. citizens awoke to 'news reports' that a YouTube video of a dress that changed colors had received 25+ million hits. People spoke about it on elevators, argued their selection of colors in cafeterias, shared and watched the video on their iPhones, and an endless round of recaps flooded every local and national news outlet. Concurrently, Americans awoke to the incredible story featured on the front page of the Washington Post about Sara Bahayi, the only female taxi cab driver in Afghanistan. This woman is the epitome of a radical feminist, but her story of courage and tenacity remained far from the topic of inane conversation. Unlike the bra burning icons of the 60's who sought the opportunity to break through the glass ceiling in Corporate America and ascend to the vaulted ranks of male executives, or even those who just wanted to escape the ennui of their housewife status; Bahayi, 38, is one of a new breed of women who are risking their lives in pursuit of basic freedoms. As Afghanistan's first and perhaps only female driver, Bahayi's life and those of her loved ones are in very real danger. Something that most women take for granted has become the focus of a feminist revolution in countries like Afghanistan and Saudi Arabia. It is easy to call yourself a feminist if you are safely ensconced in a political and social system which legislates equal rights protections, even if these protections are not always enforced. It is quite another to seek equality in a society and culture in which women are considered chattel, a precept that is enforced by Taliban militia and other radicalized groups like the Islamic State of Iraq and Syria (ISIS). Malala Yousafzai, the young Pakistani woman, who at 15-years-old was shot in the head by an assassin and nearly died because of her efforts to lobby for the right for girls and women to get an education, is an example of the lengths to which extremists will go to reinforce their belief systems. Bahayi has waged her quiet campaign of civil disobedience for 10-years driving a taxi through the streets of Mazar-i-Sharif. She has been threatened with grievous harm and even death, though she bravely takes the opportunity to talk to some of her male passengers to try and help them understand that driving a car even if it is a taxi, is not sacrilegious. However, most of her passengers are women who seem to feel more comfortable riding inside the car with a woman driver, and even in some cases riding in the front passenger seat. Unlike the feature photo in which Burqa clad women are forced to ride in the open trunk of a car, Bahayi has literally taken control of destiny at the wheel of her taxi. According to the Washington Post, she earns roughly $10-20 she earns per day. As an unmarried, childless woman, she uses the money that she earns to help support 15 relatives. "She started working outside the home in the late '90s when her brother-in-law was killed by the Taliban; a male neighbor taught her to drive after Bahayi decided her high school teacher's salary was insufficient; she got her drivers license two years ago in a class of 30 students, all male, only nine of whom passed the test. When driving into Taliban-controlled areas, she sometimes disguises herself as male..."
Bahayi has waged a quiet revolution and it is nice to read that her inspirational story was brought to international attention. Reportedly she is in negotiations to open a dealership. Because of the complexity of property ownership in Afghanistan's patriarchal society, she will require the initial investment and auspices of male partners to launch her business. However, she has stated that once the business is established, she hopes to transform it into Afghanistan's first female-owned car dealership. Watch her tell her story in her own language. BALKH, Afghanistan — During Afghanistan’s university entrance exams last month, a girl named Shohreh Ghaderi scored the highest of anyone in the country. She beat over 225,000 other test-takers. Considering Afghanistan’s history of repressing women’s education, Ghaderi’s feat is challenging the status quo of families not sending their daughters on to higher education. The university entrance exams in Afghanistan, known as the Kankor, are the Afghan equivalent of the American SATs, but far more imperative for Afghani students. Only about thirty-percent of the students that take the Kankor will be accepted to a public institution of higher education, according to Outlook Afghanistan. Ghaderi, however, will be one of the fortunate ones that will be going on to university. On taking the exam she said to BBC News, “There were 160 multiple choice questions. I only made three mistakes. I remember I was doubtful of one question. It asked what the chemical formula was for phosphoric acid. It was a very easy question, but I don’t know if I chose the right answer.” Despite those three mistakes, she managed to earn the highest score in the country. AFGHANISTAN — The concerted efforts of Afghanistan and US governments will not be enough to curb this year’s opium industry in Afghanistan. The high unemployment rates and political instability in the country will create a surge of opium production and usage; which is predicted to break records for this year. With the threat of complete crop destruction forcing people into the arms of the Taliban, but also a desire to eradicate the drug, this year’s booming opium growth is prompting new courses of action. Opium, from poppies, is the main ingredient used in heroin. Three-quarters of the world’s supply of opium is grown in Afghanistan. According to VICE News, it is predicted to reach ninety-percent by this year. The Washington Times reports there has been a thirty-six percent increase in poppy farm acreage, to approximately 516,000 acres. The US currently spends $7.5 billion on defensive measures against the opium trade. Despite production of opium in mostly the southern and western provinces of Afghanistan, US forces are being located to the east to combat the trade. The Special Inspector General for Afghanistan Reconstruction defends the shift to the east because it is “generally less than the threat in the south and southwest”. The US forces are trying to fight the trade in the opposite direction of the problem. Due to the end of the war in Afghanistan, foreign troops will be leaving by the end of the year, taking with them the most effective combative forces against the trade, as well as much of the country’s stability. As they face staggering unemployment and security concerns against forces like the Taliban, the lack of foreign aid could promote the opium industry. 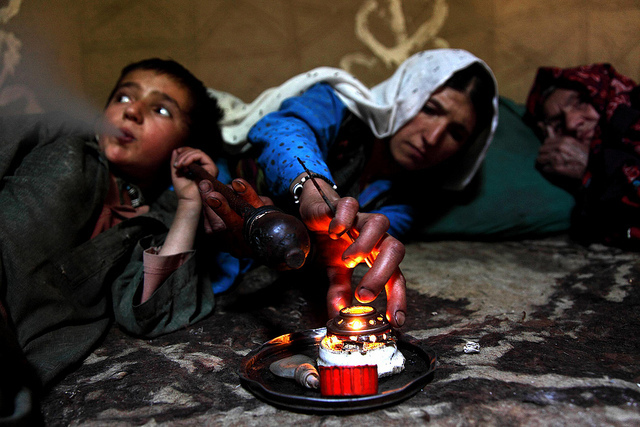 Opium-use is rising among Afghans because of the tough economic times. The Guardian reports about 1.3 million Afghan adults were regular drug users in 2012 out of a population near 32 million. Not only is the demand increasing, but it is providing jobs for those unemployed more than any other form of cultivation. Some see the possible utilization of opium production as a solution to actually provide economic growth and stability for the weak Afghan government. Vanda Felbab-Brown, an expert on counter-narcotic efforts in Afghanistan, told VICE News that because opium cultivation is labor-intensive and profitable, if the 806 square miles of opium fields last year were instead wheat then that would only create twenty percent of the jobs that the opium fields provided. What concerns the US government, though, is more than the illicitness of the opium trade and drug use; The US is more concerned with the implications that this trade can have on strengthening the Taliban and warlords. The poor farmers are not the ones who profit off of the opium crop. The local warlords, Taliban, and wealthy elites connected to the government instead pocket the revenue, according to VICE News. The DEA claims that high-ranking Taliban members double as drug lords who finance terrorist attacks using drug money. TEHRAN, Iran — Three men and three women were arrested in Tehran after posting a YouTube video of themselves dancing to Pharrell Williams’s hit song “Happy." The video entitled “Happy in Tehran” was deemed obscene by the Tehran police chief, Hossein Sajedinia. The country, however, has rallied around the six young Iranians and is criticizing the government for being too socially restrictive. Subsequently, five of the dancers in the video have been released, but the director is still being held in police custody, according to CNN. 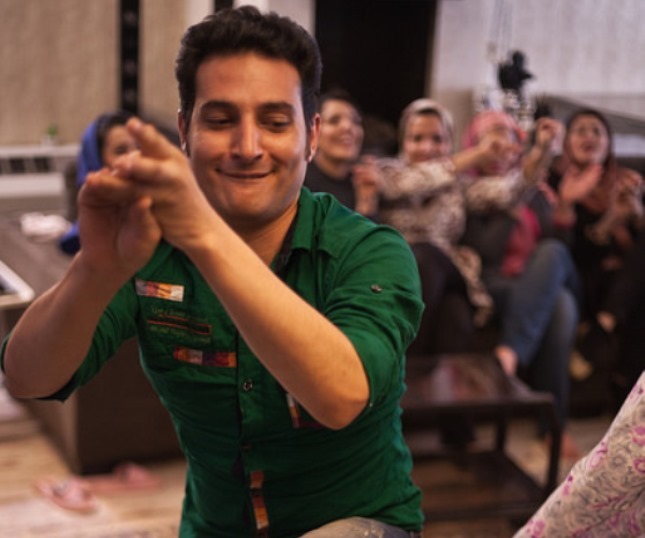 The “Happy in Tehran” video depicts the Iranians dancing around different locations to the song “Happy”. Most notably, the three women were publicly unveiled—a punishable offense in Iran. It became a viral video in Iran and was shared all over social media. When it was posted in April, the video garnered more than 165, 000 views on YouTube before it was blocked. After the arrest, The Huffington Post says a public interrogation was held on Iranian state TV. On Iranian TV, the video creators were identified as “actors” who were coerced into making the video for an audition and told that it would not be aired. The Iranian regime that has been in power since the 1979 revolution enforces conservative, religious values that result in the limitations of internet publication. The “Happy in Tehran” video represents how social media has been used globally to rebel against this kind of hardliner authority. After the arrests of the creators, most people seemed to defend them. Other Iranians reposted the video adding “#FreeHappyIranians” in support of the detained. Even the president of Iran, Hassan Rouhani, came to the defense of the creators. He tweeted today, in reference to the five creators’ release, a quote he made last year, “#Happiness is our people's right. We shouldn't be too hard on behaviors caused by joy.” Reuters reports that Rouhani has been vocal about his opposition to harsh internet censorship saying in a speech from this weekend, “We ought to see (the Internet) as an opportunity. SOMA, Turkey— At least 245 Turkish miners have died and 120 are still trapped after an explosion of a coal mine in what is being called the “worst industrial accident in the country’s history”. Hopes of rescuing the remaining miners are “dimming” according to Energy Minister Taner Yildiz. Thousands of people are rallying in response in Turkey, angered by the disaster and the lacking efforts from the government and rescue agencies. Tensions are rising above ground as well in the nearest city to the mine, Soma. Friends and relatives of the deceased and trapped miners are venting frustrations against Prime Minister Erdoğan and his Justice and Development Party. Erdoğan’s government has a questionable history with the mining industry. Turkey was ranked third worst for worker deaths by the International Labour Organization in 2012. The New York Times says just two weeks ago they vetoed a proposition for a parliamentary commission that would try to alleviate the dangerous conditions in the mining industry. His government is further criticized for not responding to his rival party, Republican People's Party. They requested action on work-related incidents in the Soma mines in April, but were refused. Violent demonstrations concerning the mining accident are occurring in Soma as well as in the country’s largest city, Istanbul, and the capital, Ankara. Wednesday afternoon protestors, mostly teens and 20-somethings, confronted riot police at the headquarters of the Justice and Development Party, according to The Huffington Post. They also said that the police were equipped with gas masks and water cannons. The protestors could be heard shouting that Erdoğan was a “murderer” and a “thief”. It was reported that hundreds of protestors were also at the Soma Holding headquarters, the company that owns the mine. Erdoğan’s presence at the mine furthers the anticipation of his candidacy in the upcoming presidential election, despite him not confirming a bid. He has postponed an international trip, instead going to visit the mine. He also has declared three days of mourning in Turkey for those miners lost. According to The Huffington Post, in the past he has been unsympathetic to the dangerous mining conditions in Turkey, saying after a 2010 accident where 30 miners died that it is part of the “profession's fate”. In the case of this accident in Soma, Erdoğan insists that it will be fully investigated. On the miners still trapped, the prime minister said, “Our hope is that, God willing, they will be brought out. That is what we are waiting for." TURKEY, Ankara - First Twitter and now YouTube, social media platforms in Turkey are continually being banned by the Turkish Telecommunications Authority. This latest YouTube ban comes after a video posted on March 27 on the site that is supposedly of an audio recording of top Turkish officials discussing a military operation against Syria, according to CNN. This leak was followed by Turkish Prime Minister Recep Tayyip Erdoğan’s accusations that YouTube and Twitter are being used to slander and spy on the government. The Twitterban came first on 21 March 2014 after a re-election rally during which CNN quoted Erdoğan as saying he was determined to “root out Twitter”; however, the ban was deemed unconstitutional by the Turkish high court. The YouTube ban followed six days later. Besides the audio recording of a planned false-flag against Syria, more audio was leaked that incriminate the Justice and Development party leader, Erdoğan. What he calls “immorally edited material”, had been published on YouTube that supposedly was of Erdoğan instructing his son to hide millions of dollars from the police, further implicating him of corruption allegations. After public outcry and protest, the 27 March 2014 YouTube ban was overturned 2 April 2014. Al Arabiya News said that the ban was found to be in violation of human right and instead of a site-wide sanction, 15-videos were banned. However, just two days following the lifting of the ban, it has been reinstated. This back-and-forth with the rulings against YouTube has created more mass disapproval in Turkey and internationally. Losing EU favor is only the beginning. The US has also been vocal about their objection to Erdoğan’s social media ban. Al Arabiya News reported that last Friday, Washington had been urging the Turkish government to “open all social media space in Turkey”. Even the massive internet company Google has joined the protest against the YouTube ban. Russia Today reported that Google has appealed the YouTube ban to Turkey’s Constitutional Court. Since Google Inc. is the owner of YouTube, a Google spokesperson told Wall Street Journal via email, “it is obviously very disappointing to people and businesses in Turkey that YouTube is still blocked, and we are actively challenging the ban in the courts,” and that the YouTube ban impedes on “freedom of speech”. 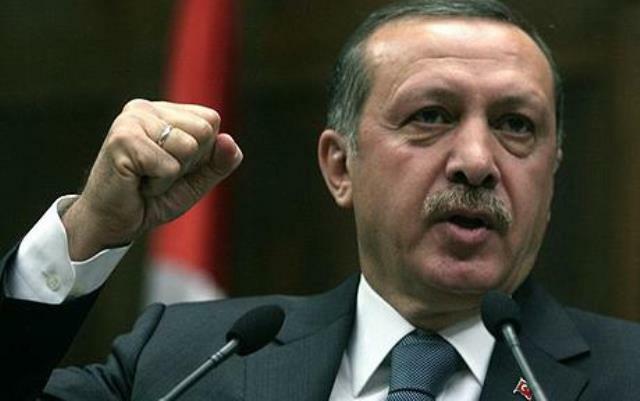 Any negative impact of these social bans on Erdoğan’s chances of winning has yet to be determined. Prime Minister Erdoğan is currently running in the Turkish presidential election. Local elections in Ankara were challenged March 30 after claims of corrupted results, of which Erdoğan won. Reuters reported that the opposition party’s call for a recount was denied. It appears that in local elections his candidacy has not been tainted. Turkish national elections for presidency will take place on 10 August 2014.